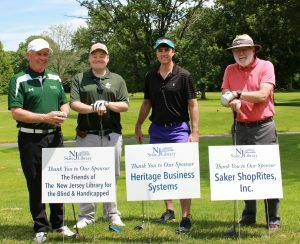 Under a sunny sky with a refreshing breeze, over 40 golf enthusiasts, including those with visual impairments, took to the links of the Hopewell Valley Golf and Country Club in support of the NJ State Library Talking Book and Braille Center on Monday, June 11. 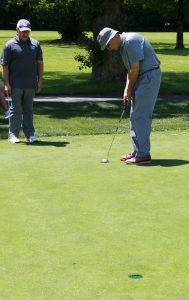 This marked the seventh year of the tournament, which featured a shotgun start at noon . An awards dinner followed. The historic golf course reopened under new management early in March 2016. The 90 year old facility is located on the banks of the Stony Brook in Hopewell Township. The championship course was designed by Thomas Winton, noted Scottish golf architect, in 1927 as a private and secluded golf sanctuary. The Scottish heritage and design style of Winton is visible throughout the course. The number 13-hole is the Club’s signature hole: it is a par three with 150 yards separating tee to green with only water in between. It is a definite make or break hole. Some updates to the course were made by golf architect Robert Trent Jones.